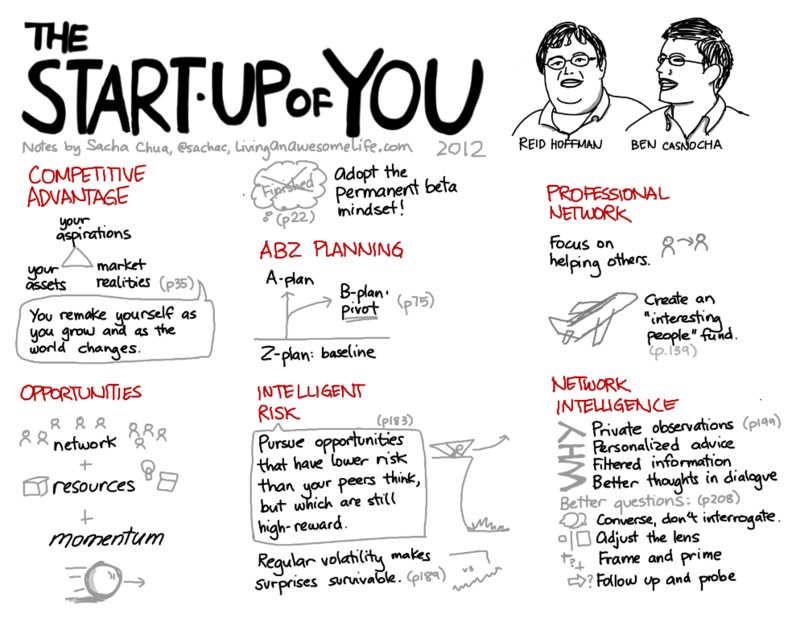 The Start-up of You is a book about networking and career planning using tips pulled from the startup world, sprinkled with hip jargon such as “pivot” and “volatility.” It’s a decent book for people who are new to connecting or cultivating their network and who also like reading about technology and entrepreneurship. If you’re a fan of The Lean Startup and similar entrepreneurship books, The Start-up of You is like seeing those ideas applied to other parts of life. It’s easy to read, and it flows well. I liked examples such as the “interesting people fund” and the idea of having A-B-Z plans. There are good tips for asking your network better questions (p208), too. If you’ve read a lot of other networking or career growth books, though, you might not come across many new aha! moments here, but it’s a good startup-influenced view at managing your own career. Are you a visual learner? Check out my other sketchnotes and visual book notes!